NASA’s Curiosity rover has just successfully bored inside ancient rocks on Mars for only the 2nd time since her nail biting landing in August 2012 inside Gale Crater as she searches for the ingredients of life. On Sunday, May 20, the rover drilled about 2.6 inches (6.6 centimeters) deep into a target named “Cumberland” to collect powdery samples from the rock’s interior that hold the secrets to the history of water and habitability on the Red Planet. “Cumberland” is literally just a stone’s throw away from the first drill target named “John Klein” where Curiosity bored the historic first drill hole on an alien world three months ago in February. Analysis of the gray colored, powdery “John Klein” sample by Curiosity’s pair of onboard chemistry labs – SAM & Chemin – revealed that this location on Mars was habitable in the past and possesses the key chemical ingredients required to support microbial life forms – thereby successfully accomplishing the key science objective of the mission and making a historic discovery. The Cumberland powder will be fed into SAM and Chemin shortly through a trio of inlet ports on the rover deck. ‘Cumberland’ lies about nine feet (2.75 meters) west of ‘John Klein’. Both targets are inside the shallow depression named ‘Yellowknife Bay’ where Curiosity has been exploring since late 2012. The six wheeled NASA robot arrived at Cumberland just last week on May 14 (Sol 274) after a pair of short drives. The science team directed Curiosity to drill into ‘Cumberland’ to determine if it possesses the same ingredients found at “John Klein” and whether the habitable environment here is widespread and how long it existed in Mars’ history. “We’ll drill another hole [at Cumberland] to confirm what we found in the John Klein hole,” said John Grotzinger to Universe Today. Grotzinger, of the California Institute of Technology in Pasadena, Calif., leads NASA’s Curiosity Mars Science Laboratory mission. “The favorable conditions included the key elemental ingredients for life, an energy gradient that could be exploited by microbes, and water that was not harshly acidic or briny,” NASA said in a statement. ‘Cumberland’ and ‘John Klein’ are patches of flat-lying bedrock shot through with pale colored hydrated mineral veins composed of calcium sulfate and featuring a bumpy surface texture inside the ‘Yellowknife Bay’ basin that resembles a dried out lake bed. “We have found a habitable environment [at John Klein] which is so benign and supportive of life that probably if this water was around, and you had been on the planet, you would have been able to drink it,” said Grotzinger. 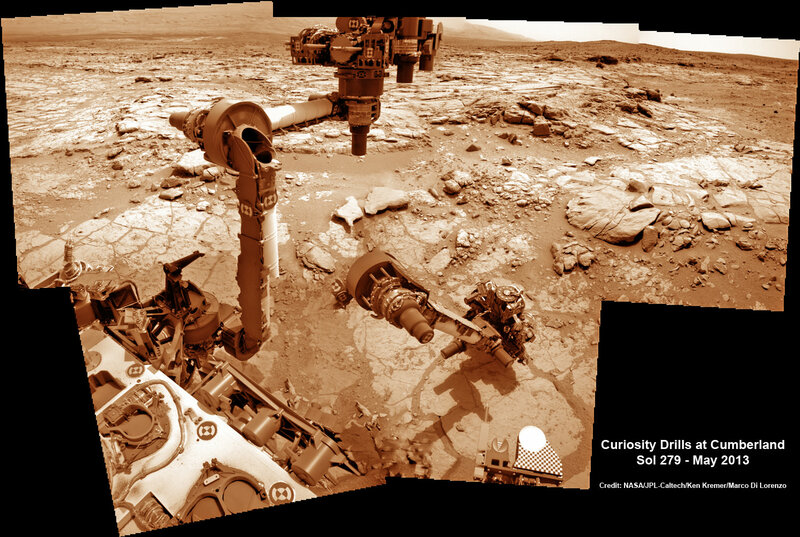 Curiosity will remain at Cumberland for several weeks to fully characterize the area and then continue exploring several additional outcrops in and around Yellowknife Bay. “After that we’re likely to begin the trek to Mt. Sharp, though we’ll stop quickly to look at a few outcrops that we passed by on the way into Yellowknife Bay,” Grotzinger told me. One stop is likely to include the ‘Shaler’ outcrop of cross-bedding that was briefly inspected on the way in. Thereafter the 1 ton rover will resume her epic trek to the lower reaches of mysterious Mount Sharp, the 3.5 mile (5.5 km) high layered mountain that dominates her landing site and is the ultimate driving goal inside Gale Crater. June 11: “Send your Name to Mars” and “LADEE Lunar & Antares Rocket Launches from Virginia”; NJ State Museum Planetarium and Amateur Astronomers Association of Princeton (AAAP), Trenton, NJ, 8 PM. June 12: “Send your Name to Mars” and “LADEE Lunar & Antares Rocket Launches from Virginia”; Franklin Institute and Rittenhouse Astronomical Society, Philadelphia, PA, 8 PM. Yes, take your time and be extra extra careful to double dip. Lake water 2 meters away could easily have been harshly acidic and inhospitable. Like you knkow, sarcasm. Gutless geeks get gloriously giddy gouging goopy grunge ….alliterally. You deliberately misread. The science lead describes how they are confirming the observation (which could have all sorts of problems and variation aside from the varying local constituents) and that they will characterize the area. Nothing gutless or geeky about any of that, it’s SOP. What is gutless and geeky is complaining way distant from the actual work, huddled above a keyboard, signifying nothing … literally. Double up and get that data! Still hoping you serendipitously see fossilized diatoms and plankton though…. THAT’d be trick, and now not as entirely impossible as once presumed! That rover must simply carry with it tools to make a thin rock slice, or to hone some rock surface smooth, and a microscope to then look at it, and they must simply have used it or plan to use it. Why do they not tell?